Alastair Cook is the name on everyone’s lips as his England team suffered yet another Test match defeat, this time to India at the Home of Cricket. Cook’s side are now on run of 10 Tests without a victory and there are calls from fans and pundits for the England captain to step aside and take a break from the game. The opening batsman stood firm after the 95-run defeat at Lord’s and will stay on as skipper for the third Test, which England are 7/4 with Ladbrokes to win, at the Ageas Bowl starting on Sunday. But with the pressure mounting on Cook’s position following one the worst periods in English cricket the ECB could be looking for a new leader in the not too distant future and Ladbrokes News looks at four potential candidates for the top job. England’s best batsman has been in dreadful form so far this summer but should Cook fall on his sword Bell, who is vice-captain of the side, would be high on the list of potential replacements. With 92 Test matches and 20 Test hundreds to his name, the Warwickshire batsman has the experience to handle the top job and has been praised for his tactical brain when skippering his county. But with his form a far cry from last summer’s Ashes and England seeing what the burden of captaincy has done to Cook’s form, handing the reins to Bell could be a gamble which could back-fire quickly. 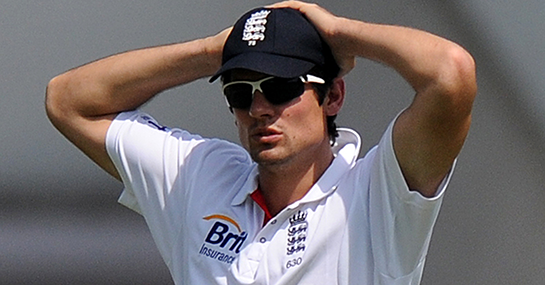 There is no doubt the Yorkshireman is a future England captain but giving him the top job now may not be a smart move. Root has been England’s best batsman this summer with a Test-best double century against Sri Lanka at Lord’s and another big hundred in the opening clash with India at Trent Bridge so why risk burdening him with the captaincy? Shane Warne certainly doesn’t think it’s a risk after throwing his weight behind the 23-year-old to replace Cook: “Root could well be someone who has it in him to captain his country. He’s still very young but he’s shown plenty of good, positive and encouraging characteristics in his short spell in Test cricket.” But we all know it’s anyone but Cook for Aussie legend Warne! Broad has hardly been a huge success as captain of the England Twenty20 side and recently oversaw the humiliating defeat to Holland at the World Twenty20. But Broad’s positive and aggressive attitude could be just what this England side needs as they attempt to produce a turnaround in fortunes. Just like Cook and Bell, Broad’s form is a huge worry as he has looked a shadow of the bowler who has taken 238 Test wickets and is reportedly struggling with a knee injury. Along with most of the leading candidates, the 28-year-old does not have much experience of captaincy in the longer format of the game but neither did Cook when he first took over. Championed by former England captain Michael Vaughan, the Middlesex man may be a left-field choice having not played a Test match for his country since February 2012 but he has had success as England’s stand-in one-day captain. When skippering England in the 50-over format the Irish-born star, who has scored two Test centuries, has averaged 73 with the bat, showing his batting can cope with the pressure of leadership. He has also skippered the England Lions and impressed as Middlesex’s limited overs captain this season. But with a Test average of just 30.43 in 16 matches Morgan is not guaranteed a place in the side.